Today the Institute for Fiscal Studies (IFS) said that the Government’s plan for fiscal consolidation is regressive, and will hit the poorest disproportionately hard, once cuts to welfare are fully taken into account. Today the Institute for Fiscal Studies (IFS) said the government’s plan for fiscal consolidation is regressive, and will hit the poorest disproportionately hard, once cuts to welfare are fully taken into account. Analysis from the IFS shows that the poorest income decile will lose the largest percentage of income because of the proposed changes to welfare. Their numbers show that the reforms in place by 2012-13 are “slightly regressive” or flat within the bottom nine-tenths of households. The IFS disputes the Treasury’s claim the reforms are progressive, and argues the changes by 2014-15 will be “clearly regressive”, stating families with children will be the biggest losers. IFS acting director Carl Emmerson said chancellor George Osborne’s baseline did not include cuts already taken and the June budget. He told gathered media that the Treasury’s claim that overall the tax measures were progressive was due to the new Government’s implementation of the tax increases announced by the previous Labour Chancellor. This includes the 50p rate – of which George Osborne said “I don’t like it” – and the NICs increases which the Tories described as a “jobs tax“. “Our analysis – published in August, shows that by including a wider set of benefit reforms announced by this Government leads to the conclusion that the impact of all tax and benefit measures yet to come in reduces the incomes of lower income households by more than that of higher income households with the notable exception of the richest 2% of the population who are the hardest hit. “Therefore the tax and benefit changes are regressive rather than progressive across most of the income distribution. And when we add in the new measures announced yesterday this finding is, unsurprisingly, reinforced. An IPSOS-Mori poll brought further bad news for the coalition government today. Two-thirds of those surveyed would prefer slower spending cuts rather than cutting spending too quickly; this is a slight drop since September polling, back down to June levels. “families with children will be the biggest losers”. Good – they get enough of my money anyway. The other thing that everyone is missing is what would be the impact of not doing anything and allowing interest rates to rise – who would be affected most then? What if, even though this is bad for the poorest, ‘doing nothing’ would be even worse for them? @Mark, if you care to check the facts before you spout rubbish. You should consider the financial cost of funding the war against peasants. A few measly pennies from your tax goes toward welfare benefits, the majority is buying helicopters and missiles to kill people. it depends how we define ‘poor’. 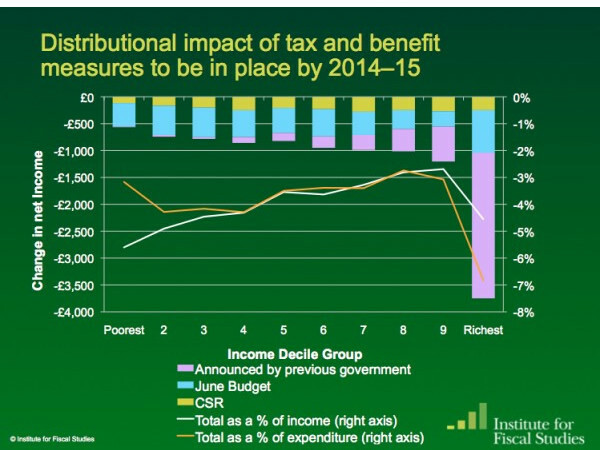 the poorest 10% are not working and will be on full-time benefits. they are therefore ‘time rich’. which is presumably why they’re all pissed by about 11 in the morning. What we see is an ugly chimera of a Tory strategy being steam rolled out with few concessions, even to the LibDems. It comprises a regressive spending review attacking the welfare systems, combined with the ailing concept of the Big Society (albeit mostly rhetoric) dragging along behind, apparently to fill the social vacuum left behind. Without a rolling back of the public services, what chance for the Big Society? Nil; it would be as useful and viable as John Major’s Cones Hotline. Without the Big Society, or more likely even with it, what hope is there for the poorest in society. The young and the poorest face the cuts, whist they wait for the ‘great and the good’ to deign to open a soup kitchen, a free school, or provide some other essential service on the cheap. For the elderly, well they fair slightly better, but then on balance they do tend to turn out and vote Tory. Divide and rule, slash and burn, and economic self-harm are the order of the day! The message to the young – go out and protest, show how much you want change – if not we’ve got five years of this. ps why does my comment need ‘approval’? why so controlling? you’ll never be popular if you filter out opinions you disagree with. Mark, the best way to cut a deficit is for the economy to grow, which the OBR has said will be compromised by this. And why is it that the poorest are bearing the brunt, whilst the banks get away with it? Lets just remember for a second that the former director of the IFS is now the head of the OBR! Jeff_h, every new ip address needs to be approved to protect us from having the comments sections overrun by spam.